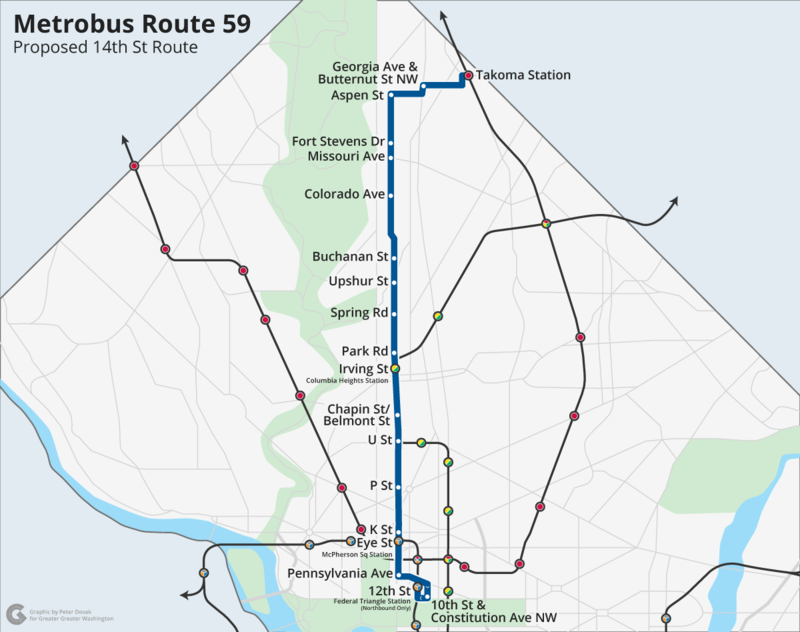 Since November, riders, allies, ANC commissioners, and Greater Greater Washington have been advocating for the 59, a bus that would operate like an express route along 14th Street NW. Today, DC Mayor Muriel Bowser announced her support, saying she’s included funding for the 59 in her upcoming budget. And there’s a bonus! She’s also pushing for a similar bus east of the Anacostia River. Riders have faced overcrowded and insufficient service on 14th Street for years, even as the area has experienced tremendous residential and commercial growth. Reviving a previously-shelved WMATA proposal from four years ago, advocates have been asking officials to fund a 59 limited stop service line to supplement the existing service available. The new service would dramatically cut transit times for many workers and neighbors, as well as help reduce congestion overall along the route. Bowser highlighted that for the bus to work, it needs to be timely, dependable, and comfortable. She explained that she is proposing funding for the 59 in this budget cycle and hopes to add new route improvements in future cycles. The 59 route. Image by Peter Dovak used with permission. Mayor Bowser's new budget will include funds for expanded W4 service. The W4 runs from Deanwood to Anacostia. Image by WMATA. Finally, the mayor had surprise good news as well: because of the efforts around the 59 bus, she asked her planners to identify other routes suffering from overcrowding. They identified the W4 route, which runs from Deanwood to Anacostia, as a good candidate. The budget will also include money to improve it. This doesn’t mean the 59 is a sure thing, but it is the single most important step toward getting the bus rolling. Now that we have the mayor’s support, we need to work with councilmembers to make sure they don’t cut the funding during upcoming budget negotiations. The good news is that a majority of the DC Council has indicated support for funding the 59 bus. Councilmembers Nadeau, Todd, Evans, Silverman, Grosso, Allen, and White have all publicly advocated for the funding. Councilmember Cheh, who chairs the Transportation and Environment Committee, hasn’t taken a position yet. Her support would help build more momentum and remove a potential hurdle. As I said at this morning’s announcement, in a city rapidly attracting affluent new residents and with a growing tax base, it’s essential to use that money to invest in making all District residents’ lives better. The 59 bus would shorten commutes, improve the environment, reduce congestion, improve public health, and help our city grow. These benefits will accrue to longtime residents and newer residents, young and old, and those of all races. Those are just the kind of investments DC needs. Want to help us see this through? Sign the petition if you haven’t already, or share with friends neighbors. Can you spare a few hours and volunteer? Meet us at the bus stops to talk with riders and create more of an incentive for our city leaders to finally fund the 59.